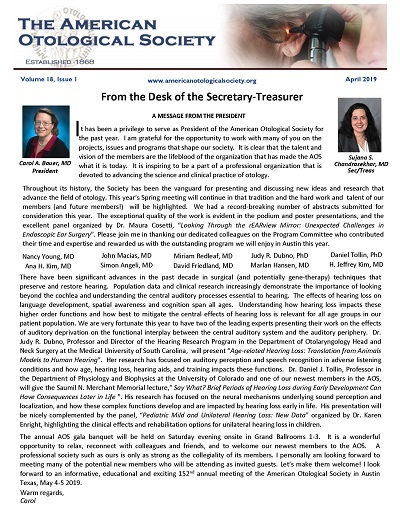 The American Otological Society is committed to the non-promotional advancement of knowledge and science and to a free exchange of medical education in otology and neurotology. The American Otological Society, through its Research Foundation, is offering Research Grant Awards, an Award for a Clinical Trial, full-time Research Training Fellowships, and a Clinician-Scientist Award. All of the AOS grant awards may involve research on any topic related to ear disorders. The research need not be directly on an otological disease but may explore normal functions of the cochlea, labyrinth or central auditory or vestibular systems. However, the applicant must describe how the proposed research will benefit our understanding, diagnosis or treatment of otological disorders. Research supported by all of the grant mechanisms can relate to any aspects of the ear, hearing and balance disorders.